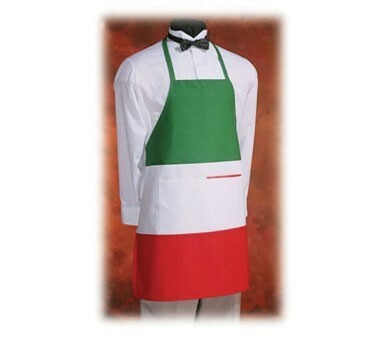 Beautifully designed with green, white, and red stripes, the Crestware IBA Italian Bib Apron is the perfect apron for employees at Italian restaurants, cafes, or bars. Combining style and functionality, this apron also provides full coverage to prevent spills and stains from soiling your staff's clothing. Crafted from a poly/cotton twill blend, this bib apron is made to look and feel good while holding up to the rigors of a busy dining establishment.